We serve the hospitality industry with a range of fresh and innovative produce sourced from leading farms in Australia and around the world. Our range focuses on local seasonal and sustainable produce. We also offer a wide variety of specialty, heirloom, premium leaf and salad produce, complimenting our full range of conventional produce. We get the importance of freshness and the innovative demands of contemporary cuisine. We adopt a fresh approach to produce supply – constantly liaising with farms, growers and clients to ensure we remain at the cutting edge of tastes and trends. We get the importance of freshness and quality – forever supplying our clients with farm fresh quality – quickly and efficiently. Our team gets the importance of produce from both sides of the plate. Stephen, a past farmer, is our produce specialist. 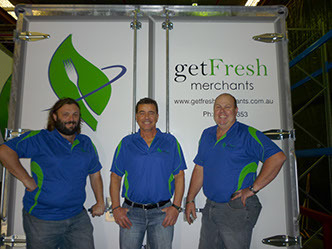 Partnered with Michael, an award-winning chef, getFresh understands the unique needs of its clients and the dynamics of produce supply. Stephen offers a wealth of agricultural knowledge. He knows about produce supply. Stephen has over 33 years experience in farming and agriculture. He also ran his own café and catering business prior to moving to ‘the big smoke’ where he pursued his passion for fresh produce. Stephen has built some very strong relationships with clients, farms and growers, forever supplying the most innovative produce to our clients and gaining respect from industry professionals through his hard work and dedication. Michael brings to getFresh a career of 18 years as a professional Chef with many awards under his belt. During his time on the front line of the hospitality industry Michael worked in a number of well-regarded hospitality establishments both locally and internationally. Michael has always had a passion for fresh produce – engrained from an early age living on the family farm where he grew his own produce. His long term understanding and application of seasonal values and variety has now led Michael to share his knowledge and passion for the produce industry to his clients and fellow colleagues. Michael has built on relationships by listening and delivering on promise. Michael comes from a large family that collectively has over 30 years experience in the Western Australian fruit and vegetable market. In his time in the industry, Michael has developed many strong relationships with local growers and farmers. Always striving for perfection, Michael adopts the latest technology so that he can service customers in the most efficient manner. Michael aims to use his contacts within the farming industry to provide clients with unrivalled service and quality standards. He is focused on ensuring that the freshest produce is directly supplied to our warehouse so that we can supply our clients with quality assurance and competitive prices. We operate through stringent QA systems to ensure that all our produce is picked, packed and delivered to the highest quality standard. We operate the latest online ordering to ensure ease of ordering. We operate a modern fleet of refrigerated delivery vehicles to ensure the cold chain is not disrupted, with our produce delivered farm fresh. Our Market City location enables 24-hour direct access to the freshest and best quality produce available from market traders and growers from around Australia and the world. We strive on supplying our clients with farm fresh quality. We’re leaders in supplying our clients with a range of conventional and contemporary produce. We’re always on the lookout for new and exciting produce items and improved supply methods. We work closely with leading farms and growers around Australia. Our dedication to partnering also extends to how we work with our clients. We focus on supplying fresh produce fast. Our commitment to our clients extends into being responsive to their needs.